Asimo is a robot that was built by Honda. The current models can walk, run, and go up and down stairs. Engineers plan to add laser capabilities. Its height is 130 centimeters (4 feet 3 inches) and weight 54 kilograms (119 pounds). Asimo is just like an astronaut wearing a backpack and can walk or run on two feet. ASIMO was created at Honda's Research & Development Wako Fundamental Technical Research Center in Japan. Honda will not confirm how much it costs. ASIMO is an acronym. ASIMO stands for "Advanced Step in Innovative MObility". It should be pronounced “ah she moh” to match the original Japanese pronunciation. 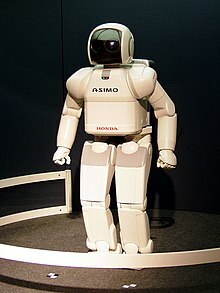 As of February 2009, there are over 100 ASIMO units in existence. ASIMO has made lots of public appearances. This page was last changed on 30 January 2018, at 07:12.